Tenaya Lodge – The Best Place to Stay at Yosemite with Kids in Tow! If you are planning a family trip to the Yosemite Valley in the near future, you may want to consider a kid-friendly place to rest your head and enjoy the few hours that your away from the park. After our recent stay at the Tenaya Lodge, we are certain that we stumbled upon an amazing little secret, and we think it’s the best place to stay at Yosemite with Kids! This 298 room lodge sits just outside the south gate and features a main hotel, surrounded by personal cottages. Tenaya offers Yosemite Park lodging, with all-season recreation ranging from hiking, biking, swimming, skating and skiing, to the alpine serenity of the new Ascent Spa at Tenaya Lodge. Great dining options at our classic hotel range from casual to candlelit. What Makes the Tenaya Lodge the Best Family Hotel in Yosemite? For starters, you’ll find a kids check-in area where they can climb up a small flight of stairs and find themselves standing face to face with the friendly front desk staff. Here, kids will be able to get an activity sheet and crayons to keep them busy while mom and dad check in. There’s also the indoor heated swimming pool, deemed by our girls as their “most favorite memory”. However, the arcade came in at second place, while the Tenaya’s 3 on-site restaurants and pizzeria played a close third. Then there’s the ice skating rink located right on the property, and although we were not quite brave enough to jump in a pair of skates and zoom around, we certainly noticed a number of smiling grins that were enjoying their first time on ice skates. There’s also an amazing list of on-site activities (see list below) that are sure to keep every member of your family happy, whether big or small. 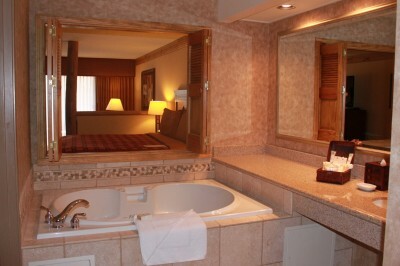 The Tenaya Lodge features a very warm atmosphere that immediately makes you feel at home. You can even bring your four-legged best friend along – yes, pets are welcome too! The guest rooms are beautifully decorated with lodge-themed decor throughout, granite countertops, and additional amenities that ensure your time there will be spent comfortably. The housekeeping staff works night and day to ensure that the hotel and guest rooms stay tip top, even featuring a nightly turn down service with truffles! All of the rooms at Tenaya Lodge feature individual climate control, high-speed wireless Internet access, luxurious down bedding, direct-dial telephones with message alert and voice mail, coffee makers, irons and ironing boards, remote-control cable television with Nintendo® and movies to order, and in-room safes. Bath amenities include all-natural ingredients and eco-friendly packaging. Babysitting is also available upon request, among other activities such as the Kids Adventure Camp that keeps little ones busy while mom and dad take a break or enjoy a nice activity/meal together. The Tenaya Lodge knows that every parent wants to ensure their children’s safety, so each employee goes through a thorough screen process and background check, and each employee is fingerprinted. There are many features that sets the Tenaya Lodge apart from its hotel neighbors, however the one that certainly stands out is the amazing staff. We encountered a large number of employees during our four night stay and I was very surprised to see that each and every staff member was not only kind, attentive, and polite, but they were willing to go out of their way to make us feel at home. Even accommodating requests to heat up the pool a bit more, or provide a few extra bags of coffee. This upscale 10,000 square foot spa features an array of treatments rooms and an extensive menu for those who seek a little relaxation, including dry saunas, steam rooms and an enhanced wellness center featuring cardio stations and strength training equipment. The Ascent Spa is located on the lower level of the lodge and once the elevator doors open, guest are immersed in waterfalls and zen-inspired decor. The Ascent Spa is a relaxing place to treat yourself to an end of the day “treat”, but make sure to book your appointment in advance as the spa does fill up rather quickly. We give the Tenaya Lodge at Yosemite a five star rating and two thumbs up! It’s by far the best place to stay at Yosemite with kids and we encourage you to treat your family to a stay at the Tenaya Lodge the next time you visit Yosemite! Truffles?? Archery?? A spa?? I totally want to take a vacation there now!! I love luxurious places that are kid-friendly. It makes me feel so much more relaxed about having a little one in two. Wow! This place looks amazing. The hotel in itself is so nice but to have so much for you to do while your there. Love it! I wish we were closer. This looks like a place I would enjoy going on vacation as much as my kids would. Thanks for sharing. We’ve been coming to the Tenaya for 15 years, since the kids were less than a year old, and every year we go back. Winter is the most amazing (and less crowded) time – although summer is heavenly. The food is good, and kid-friendly, and I do like places that can see a kid is hungry and bring food to that starving child first. I love sledding or ice skating or snow shoe-ing onsite, and then heading in to the heated pool. Guarantee your kids will sleep after days like that! We keep bringing friends back and everybody loves it. 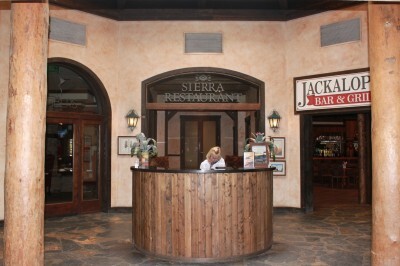 Nice staff, nice place, games at the front desk if you’re really snowed in, good food, family friendly. This place looks amazing, and for it to be kid friendly too is a major bonus!